Friends of Tortuga | solidarity is power! Pizza Party Benefit for Tortuga in Germany! More support from far away! 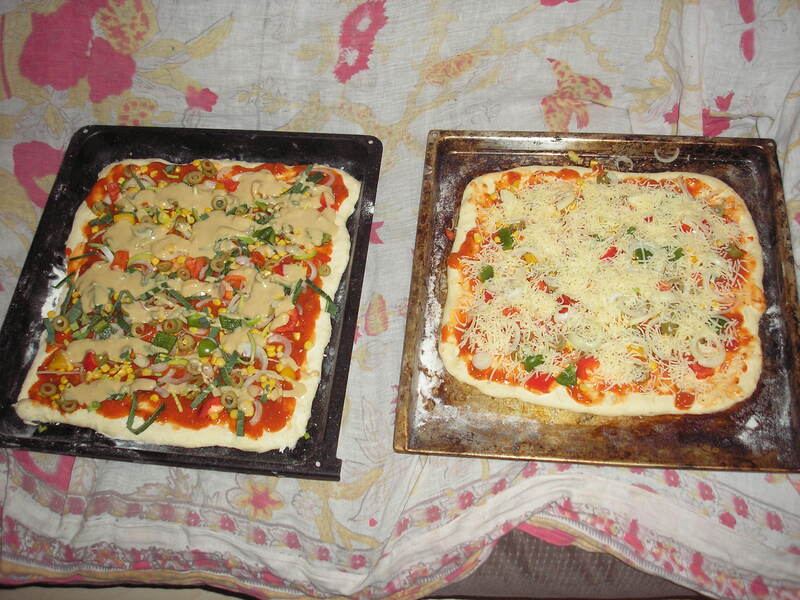 A pizza party was held as a benefit for Tortuga House all the way in Germany!!! Finally the state of Pennsylvania has decided to unseal the affidavit which lead to the arrests of the “Twitter 2” at the Carefree Inn outside of Pittsburgh, PA on September 24th during protests against the G-20. The affidavit which is signed on September 24th, 2009, by State Troopers Glenn D. Hopey and Gregg J. Kravitsky (who also signed off on affidavits during the 2000 RNC protests in Philadelphia) has been kept under seal since the arrests meaning that neither our lawyers our us were able to have access to it. There is not much valuable information that we can obtain from reading this recently released affidavit. It seems that undercover state troopers were in attendance at spokes council meetings in Pittsburgh, and from there they claim to have followed Elliot Madison via car as he left the meeting on the 23rd, following him to the Carefree Inn where his room was raided the next day. With that we present you with the affidavit in PDF form. All of the redactions made in black were made by the State of Pennsylvania presumably to hide the identities of state troopers who infiltrated the spokes council meetings, all the redactions in red were made by us to remove home addresses and other personal information of our roommates and their families. 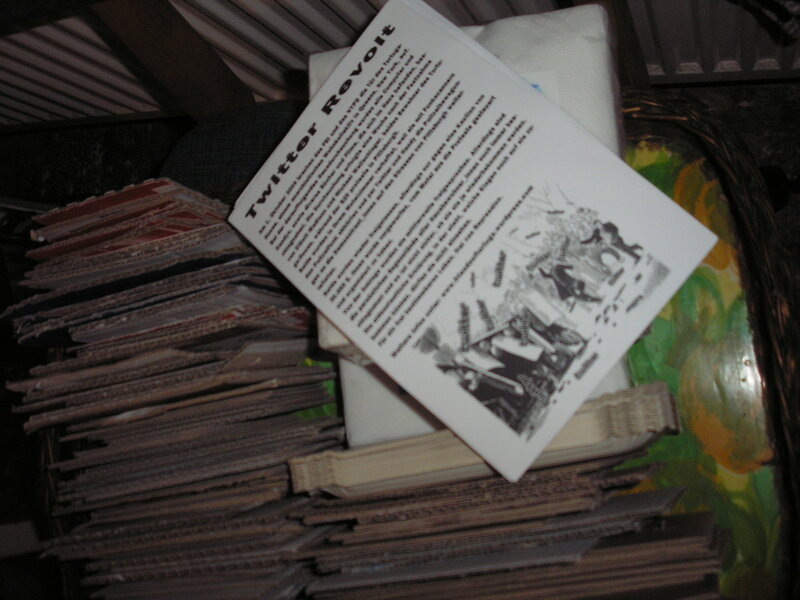 It has been several months since our last communication regarding the “situation” here at Tortuga House, but with nothing more than the seemingly interminable filing of legal motions by our defense to unseal the secret affidavits authorizing the raids in Pittsburgh and New York, counter-motions by prosecutors to keep these affidavits sealed, and judicial providence obviously favoring the side which signs their checks, we may as well be submitting a blank sheet of paper for all the real news we have. With the affidavits in our case remaining sealed—the motives and strategy of the state remain in the realm of speculation and will obviously not do for any public statement. However, a recent court date in Pittsburgh has since brought us several scraps of useful information that we felt it was important to share with others. On January 15th, a court date/rubber-stamping procedure regarding a request by the state of Pennsylvania to keep the affidavit, which authorized the September 24th raid on a motel just outside of Pittsburgh and the arrest of two of our housemates during the G-20 protests, sealed for yet another 30 days yielded a bit more than the inevitable ruling in favor of the prosecution. The judge in the case, perhaps bored or suffering indigestion from eating a rich lunch, asked the state to explain why this affidavit—in a case where all charges against the accused had been dropped—required the extension of the seal. Vote Elliot Madison Twitter User of the Year! Madison, a self-described anarchist, is very open about listening to a public police scanner and then tweeting police locations. (His tweet channel was open and advertised on posters.) On September 24, police stormed the room at the Carefree Inn where he was staying with Michael Wallschlaege shortly after the duo had relayed an order to disperse. 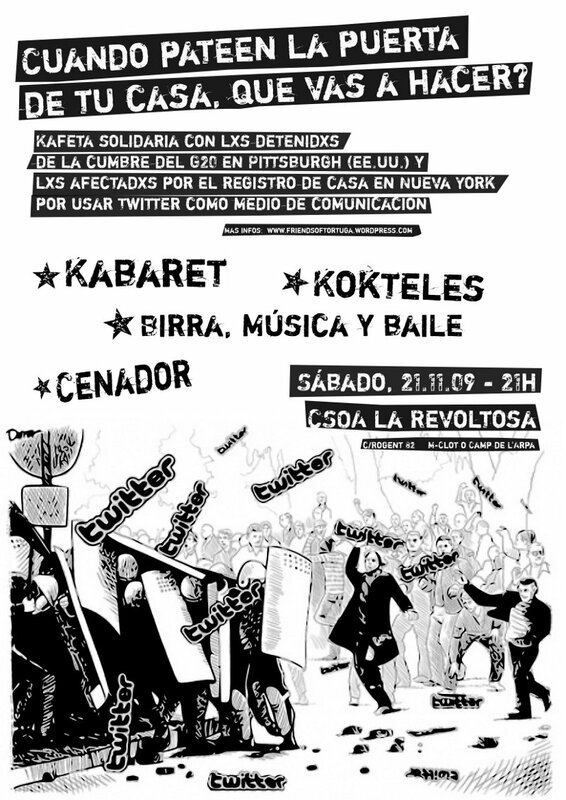 A Benefit in Barcelona for Tortuga and g20 arrestees! Thank you everyone for your solidarity and support. Although the state charges are dropped we are still facing the uncertainty of federal charges looming over us and we still have no idea when if ever we will have our belongings that were seized by the Feds returned to us. Benefits and informational events are a great way to support those facing repression, thanks to our comrades in Barcelona for holding this event!!! Federal authorities can resume combing through the notebooks, memory cards and computers of a twittering anarchist being investigated for violating an anti-rioting law, a federal judge in Brooklyn ruled Monday. U.S. district court judge Dora L. Irizzary found no reason to throw out the government’s search of the home of a 41-year old social worker who used the micro-publishing service Twitter to help anti-globalization protestors at the recent G-20 convention, clearing the way for the feds to look through the evidence they collected. Madison and his attorney sought to have his possessions returned unexamined, on the grounds the search violated his constitutional rights to free speech. 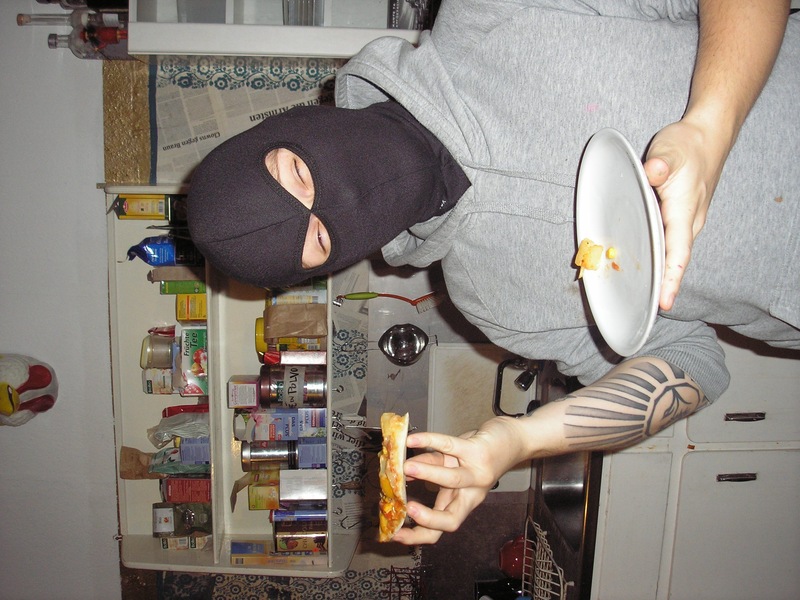 "On October 1st, 2009, at 6:00am, the Joint Terrorism Task Force (a union of local police departments and the FBI), kicked out the front door to our home—an anarchist collective house in Queens, NY, affectionately known as Tortuga. The FBI spent 16 hours ransacking our house before carting off boxes of our personal belongings, everything from computers, passports and even stuffed animals. The apparent reason for this predawn raid was the arrest of two members of our household a week earlier in Pennsylvania. Our two friends were arrested and charged with several felonies for sending twitter messages during protests against the G20 in Pittsburgh." We need money! Please click here to donate any amount you can spare. Thank you! Friends of Tortuga · solidarity is power!